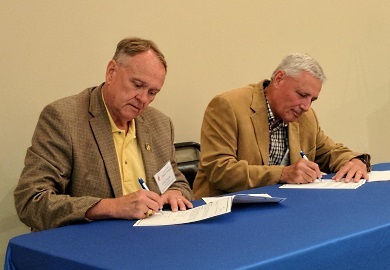 The South Carolina Department of Natural Resources (SCDNR) and Tall Timbers Research Station and Land Conservancy have entered into a Memorandum of Agreement for the establishment and operation of the South Carolina Bobwhite Funding Partnership (SCBFP). The SCBFP provides a vehicle for SCDNR, Tall Timbers, and others to work collaboratively to help fund, expedite and expand South Carolina bobwhite restoration and management through the SC Bobwhite Initiative (SCBI) and the Tall Timbers Carolina Regional Quail Project (CRQP). The SCBI is a strategy to target habitat restoration to focal landscapes on both private and public lands. These restoration efforts benefit both quail and other grassland birds that utilize similar habitats. It is a step-down plan for South Carolina's implementation of the National Bobwhite Conservation Initiative. Tall Timbers Research Station & Land Conservancy is a nonprofit organization focused on restoration of fire-dependent habitats to support high-density populations of wild bobwhites and associated wildlife species. Concurrent and in conjunction with the SCBI, Tall Timbers has been engaged with South Carolina private landowners in intensive bobwhite management and has recently begun expanding South Carolina efforts through the formal development of the CRQP. The SCBI and the CRQP are similar in that each program has objectives of restoring bobwhite habitat and populations to huntable levels across landscapes where restoration potential is high and constraints are low. The SCBFP will establish an account where willing contributors can donate funds to be used exclusively in direct support of these programs. The Partnership will be governed by a seven-member steering committee (co-chaired by SCDNR and Tall Timbers) that will assist in fund-raising and oversee project funding. "This is another step forward in our efforts to restore habitat and preserve the legacy and traditions of bird dogs and quail hunting for future generations," said Alvin Taylor, SCDNR Director. "Bridging these two programs in South Carolina will produce synergy for bobwhite restoration and allow us to leverage funds towards one common goal," said Reggie Thackston, Tall Timbers Board Member and Regional Gamebird Biologist. The SC Bobwhite Funding Partnership MOA was signed at the Sept. 27, 2017, meeting of the South Carolina Quail Council, a state-federal-private partnership created in December 2014 to provide guidance and advocacy for quail and grassland bird restoration efforts in South Carolina.